Are you in the position where you are currently searching for a party bus in Flat Rock? If so, and you are still not satisfied with what you are finding, then stop immediately. Here at Rockstarz Limousine and Party Bus, we specialize in not only providing you an amazing time, but we also provide you with a stunning bus that turns into your very own private nightclub. 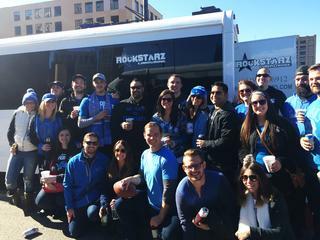 Whenever you are searching for a Flat Rock party bus rental service, you want to know that there will be adequate space for you to invite along everybody that you want to be there. Well, thanks to the design of our bus, we have made the absolute maximum amount of space possible allowing you to bring along more guests than ever before. In addition, we have added in some luxury leather chairs, so even when the party is getting too much, there is space to have a time-out. When you step inside our party bus, you will be blown away with the décor. More than that, the stereo system is going to do your music justice, and we have also added in a laser light display that just gives that extra bit of atmosphere to proceedings. In the past, individuals have sought to use our Flat Rock party bus service for a whole host of celebrations. For us, the actual reason isn’t important so whether it be your birthday, a bachelor party, or an anniversary, our main concern is that everybody is able to have a wonderful time. So, if you do live in the Flat Rock area and are on the search for a party bus, then contact us here at Rockstarz Limousine and Party Bus. You can either call or, alternatively, use the form on our website and a member of our team will be in touch to discuss your own individual needs.